Central Borlänge was swarming with people, a rarity in itself, in the afternoon of Advent Sunday. 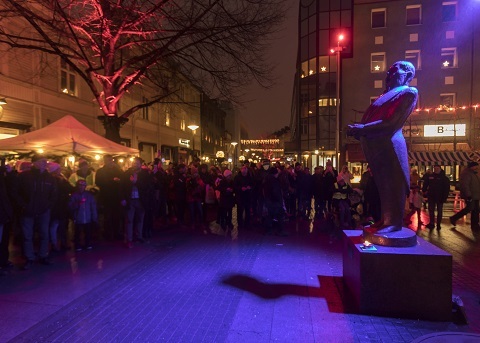 It was the premiere Christmas window display, but towards half past three many gathered at Jussi Björling Square to witness for the first time Jussi Björling as street singer. The statue was discretely coloured in red through spotlight illumination. Rikard Rudolfsson, Chairman of the cultural committee, and Patric Hammar, head of culture and leisure in Borlänge, greeted the crowd to attend the re-inauguration of the square, after extensive renovation work. Swedish Television was there, the local radio and newspapers were represented, and at 3.45 p.m. sharp Jussi himself spoke and announced that in view of that it was Advent Sunday he was going to sing “O Holy Night”. The sound streamed out from a twelve-foot-high pillar, placed just behind the statue and it was clean and well-balanced; no disco sound which one often hears in outdoor situations, but a level corresponding to what it would have sounded like if Jussi had been there in person. When Willy Gordon’s statue was inaugurated in 1990 and Rolf Björling sang, I was standing on practically the same spot as now, and the volume of that sound was comparable to what was heard now. Everything was tastefully done and the audience listened devoutly with undivided attention. When Jussi had finished the lighting was toned down and there was a tactful round of applause. During the rest of Advent Sunday he sang every hour until 7 p.m. and all through December he will sing every day at 12 o’clock noon and 7 p.m. Henceforth there will be singing on chosen occasions, next in turn on 2 February, the date Jussi celebrated his birthday. The Jussi Björling Society was founded on January 7, 1989. Its task is to promote interest in and spread knowledge about Jussi Björling, his vocal art, life and career. HERE you can quickly become a member of The Jussi Björling Society. You will receive our magazine, newsletters and invitations to events and gatherings. The annual fee is 250 SEK. Hans Thunström presents his favourite recording. The Jussi Björling Museum Greets You! BORLÄNGE is the place where Jussi Björling was born. 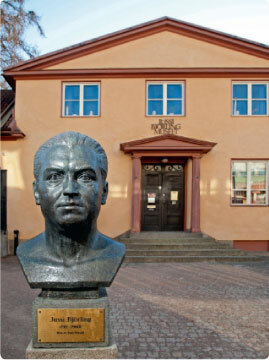 Here is also his own museum, the only Björling Museum in the world. "Of all singers' museums, this is the best", accordning to the late John Steane, noted British music critic.